The Godber mine is located east of Austin, Nevada and was discovered in 1932. First claimed under the name “Last Chance”, it was later sold to Frank Burnham and then in 1934 to Walter Godber. The turquoise ranges from medium to dark blue usually with a beautiful spider webbing. It has also been know for a very dark or black mottling forming blotches and veins running through the stone. 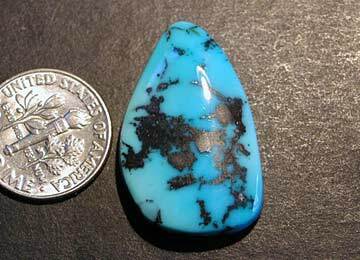 Godber has always been considered a very high quality turquoise. Oscar Branson in his book, “Turquoise” has called Godber ‘so hard…’ and ‘some of the finest turquoise in Nevada. Godber has always been a very collectable turquoise.